It seems to me that the multiverse is a popular topic in fiction today. Sure, there have been plenty of stories about parallel universes and the fractal branching of our decisions, but for some reason, there’s been an uptick in the number of these stories lately. Perhaps these stories are trying to find a better universe in which to live, or perhaps they’re trying to show us that the world we have could be much worse. 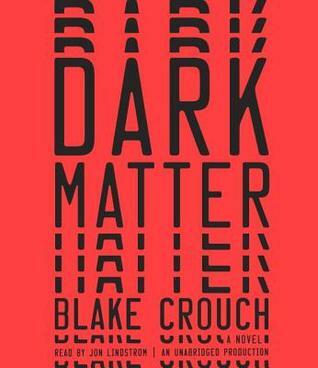 Either way, Blake Crouch’s Dark Matter nails the multiverse plot by exploring all the different connotations of the ability to travel between parallel universes. Presented in a traditional, three-act narrative, Dark Matter thrusts its protagonist into another version of his reality, ripping him away from his idyllic life. Using quantum physics as a form of magical hand-waving, the narrative then turns to the main character’s relentless search for his original universe. While the result of this exploration fits nicely into the book’s natural third act, I almost would have liked to see something a little different and less predictable. Still, all three acts are entertaining as a breathless thriller driven by the emotions and resolve of the main character. The best part about Dark Matter is how it fleshes out all the consequences of being able to travel between parallel dimensions. It’s not nearly as simple as an It’s a Wonderful Life (1946) “you-never-existed” storyline. That being said, I do question why the “original” main character had the perfect life, especially if many of the other parallel universes seemed to have relatively close representations of the life he was trying to return to. But, in the end, the narrative is driven by the characters, and these characters are well-developed and exciting to follow. A multi-dimensional thrill ride, I give Dark Matter 4.5 stars out of 5.